Take a peak at some rare souvenir buttons from the North Korean city of Kaesong. Learn about Studio Moziri. Read an interview with the small yet creative team behind some cute animations. You can watch their Valentine's Day animation, too. 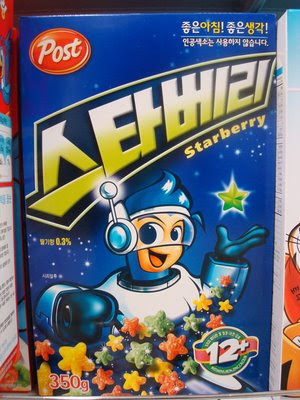 Take a stroll through a collection of the sugary cereal box covers of Korea. Guest Post! Read the first guest post to be featured on this blog. 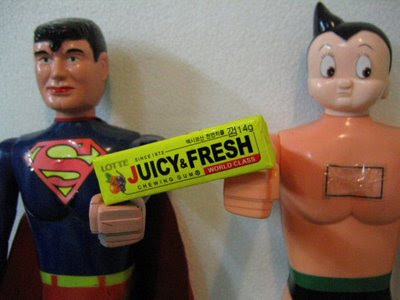 It's by Alex Powell, an expert on Korean animation, who ranks the top 5 most wanted Korean toys for us. Definitely worth a read! Thanks again to all you readers out there. If you have any suggestions for things you'd like to see posted here, please let me know. And those of you who have already given suggestions, please stay posted, I haven't forgotten and I'm still working on those.